Click on the link(s) below to learn more about rugby. Alameda Islanders are back in action with their first practice of Fall 2015 kicking off tonight, Wednesday 10/21/15 at 5pm! Coaches and veteran players will be there to welcome newcomers and resume developing skills in preparation for the competitive season in Spring 2016. After tonight’s practice, training will continue every Monday and Wednesday from 5pm-7pm at Woodstock Field in Alameda, CA until mid-December. Come join us and see why rugby is the fastest growing sport in America. 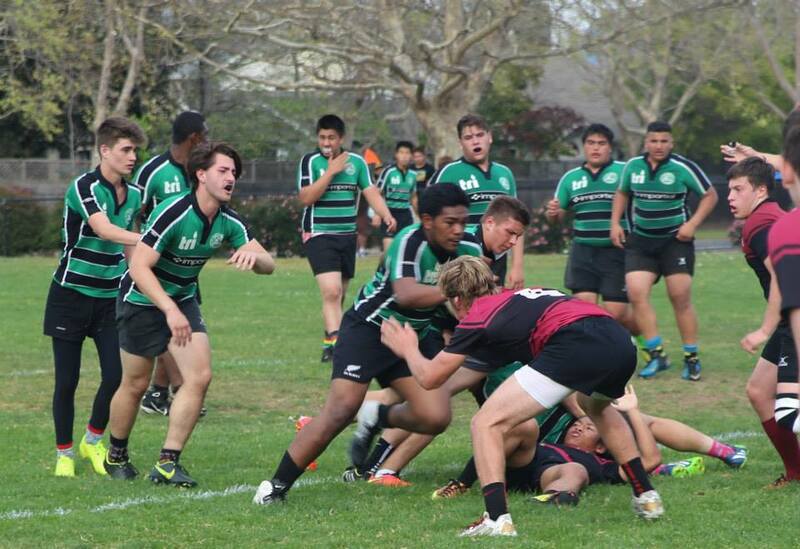 I support efforts to establish rugby teams in American high schools and colleges, and wish to alleviate any possible concerns about the sport’s relative safety. * I am a physician who is a past president of the American College of Sports Medicine; I am the author of over 200 scholarly journal articles on sports medicine (including the first-ever published study of rugby injuries in the United States); in my practice I have treated athletes of all ages from sports as varied as figure skating and football; and I am the chairman of the Massachusetts Governor’s Council on Physical Fitness and Sports. Rugby is played in over 100 countries and is the most popular team sport in nations such as Japan, Fiji, and Wales. This sport could not be as popular as it is among the peoples of so many different cultures if it were dangerous! In fact, the risk of injury in rugby is relatively low compared to sports Americans embrace – such as football, ice hockey, and lacrosse – a fact borne-out by numerous studies to ascertain the risk of sports injury in different activities. The reasons for this are quite straightforward to those of us who study sports medicine. The main reason rugby players have a relatively low risk of injury compared to football players is paradoxical – rugby players don’t wear protective equipment. Thus the rugby player doesn’t have the same disregard for the safety of his or her head, neck, and shoulders when tackling or trying to break through a tackle. The other reason is that unlike football, rugby is a game of possession, not yardage. Consequently rugby players don’t tackle by driving through the numbers as football players are taught to do with their heads when tackling a player. In rugby, players are taught to use their arms to wrap a player’s legs and let the momentum of that player cause him to go to ground. Furthermore, in rugby there is no blocking, and so players who don’t have the ball don’t get hit when they’re not expecting it. 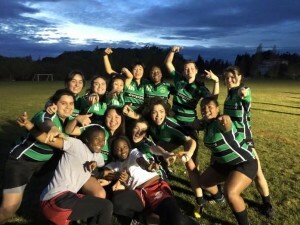 One of the reasons rugby has a reputation for being dangerous in the United States is because when the average American sees rugby being played, he or she sees a free-flowing contact sport. Because it doesn’t have the familiar stop-and-start character of football and other TV-shaped sports, to the uninitiated rugby can appear confusing and scary. 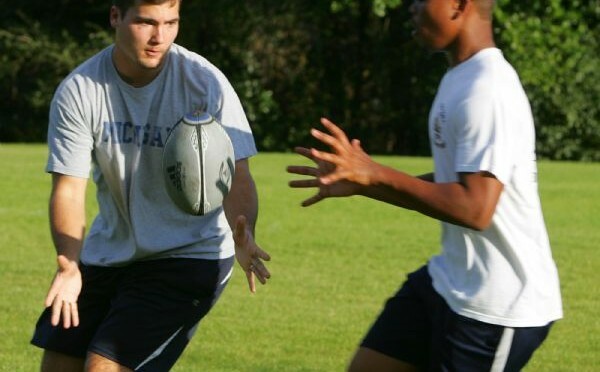 I performed one of the first studies of rugby injuries in the United States, which showed that compared to football, the incidence of injury in rugby is quite low My study was published in the peer-reviewed American Journal of Sports Medicine. Subsequent studies have supported my results. Boys’ first practice will be held on Wednesday 10/21/15, from 5p-7p at Woodstock Field in Alameda. Girls will start on Monday 10/26/15, 5p-7p at Woodstock Field in Alameda. After start of first practice, all the following practices for both boys and girls will occur every Monday and Wednesday, 5p-7p, at Woodstock Field, until mid-December. Check back for more updates or follow alamedarugbyclub on Instagram or find us on Facebook!